Companies that want to put their customers first need to start with the basics: understanding who their customers are. This seems straightforward, but the proliferation of channels where customers interact with your business makes this previously simple goal terribly complex. Just collecting the full history and relationship with your customers, let alone trusting that this information is correct and accessible to your entire team, is becoming harder every year. Why? Because each of your teams rely on a different source of truth for customer data. Your sales team will go to a CRM, your success team to a help desk, your marketing team to an email platform, and your analytics team to a data warehouse. These tools generate new, siloed customer data and have a limited view of your customer relationships, making it easy for your teams to get out of sync and even disagree about whose data is correct. To focus on your customers, not your departmental divides, you need one shared source of truth. This requires the technical capability to collect every first-party interaction and integrate that data into the many tools your teams use. Next, you need to verify that your data is correct. Then, you need to synthesize your data so you can provide relevant experiences to each individual customer. While CRM and, more recently, CDP offer partial solutions, no category of software can help you put your customers first in today’s digital economy. We believe the answer is a new category of software: Customer Data Infrastructure. Customer Data Infrastructure (CDI) is the technical foundation for customer-first businesses and provides three critical capabilities: 1) data integration; 2) data governance; and 3) audience management. Together these components help you connect and unify your first-party data, ensure your data is accurate, and cater each customer interaction to that individual’s preferences. With CDI, you can make data-informed decisions about your product and marketing, create personalized experiences, and ultimately increase customer engagement and revenue. In the past, you could manage customer relationships easily with a CRM. One salesperson owned each customer relationship, and that person manually documented their conversations in a CRM… most of the time. This practice has grown out-of-date due to the fragmentation of channels where customers engage. CRMs fail to capture key customer interactions, such as activity on your website and mobile apps, both before and after a deal closes, not to mention email, push notifications, support tickets, and more. With the increasing number of applications to power your customer experience, new infrastructure is required to integrate them. Some companies have turned to Customer Data Platforms (CDPs) to solve the problem of unifying and utilizing their data. While CDPs are a helpful step for marketers to centralize their audience segmentation, they do not collect complete or accurate data. This makes campaigns built on CDPs less effective because CDPs capture a small fraction of customer data and don’t have a way to ensure that data is correct. Without infrastructure to centralize your customer data, your customer experience is likely powered by a collection of patch-work applications, integrations, and pipelines. This makeshift solution creates an enormous problem: you don’t have access to the data that allows you to really know your customers. Why Customer Data Infrastructure (CDI)? CDI connects every single first-party customer interaction your company has on every channel, from mobile to web, in-store to backend systems, payment services to help desks, and even your CRM. Then, CDI makes this data available in whichever tools your teams prefer. Decoupling data collection from vendor implementation, CDI enables your engineers to save time writing individual integrations. CDI also helps your business teams get started faster with new tools and empowers each team member to work from a shared history of the customer. To trust that the data in your tools is accurate, consistent, and complies with internal privacy and security policies, you need a robust set of tooling for data governance. No matter how strict (or laissez-faire) your data implementation process is, your team will still find errors, missing fields, and duplicate information that slip through to production. CDI gives you confidence that your data is accurate by enforcing common data standards across your organization. You can define what constitutes good data and remove bad data at the source. Once you’ve collected the broadest set of raw data, the next step is to make that data actionable. Audience Management resolves all of your user actions into profiles and allows you to identify what’s most important to each user, like their favorite product categories and average logins per month. It amends those profiles in real-time as customers engage and enables you to deliver consistent and personalized experiences across channels. CDI ensures that when you meet your customers face-to-face or screen-to-screen, you’ll know exactly what to say. The value of Customer Data Infrastructure is greater than the sum of its parts. With CDI, your data is consistent across all of your tools, and it’s high quality. Your analyses and audiences are powered by complete and accurate data. And, you can drive personalization everywhere your customers connect with your brand. Segment already delivers on two components of Customer Data Infrastructure today. With our core data integration product, now called Connections, we support over 200,000 integrations between data sources and destinations. 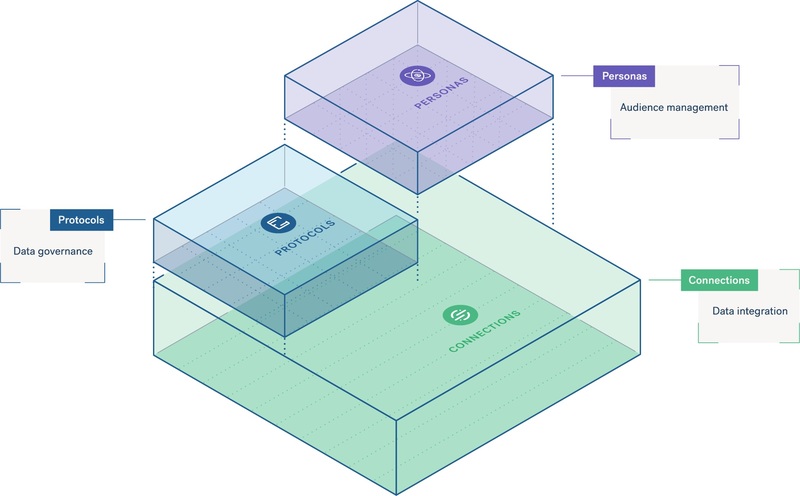 Personas, our audience management solution which we launched last year at Synapse, helps our customers deliver more relevant and human experiences for 6.3 billion of their customers. These products alone are not enough to help you build a customer-first organization. To ensure the experiences you create are relevant and the decisions you make are effective, the customer data feeding your marketing tech stack must be accurate. Today, we’re excited to share that Segment has launched the final component of Customer Data Infrastructure. Protocols, our new data governance offering, is available today. Protocols helps you protect the integrity of your data and the decisions you make with it. Using Protocols, your team can align on a data spec, validate accurate data, and enforce rules for where to send offending data. After all, what good is bad data anyway? To learn more about Protocols, head over to our launch blog here.